Boo. Marnie. Doug the Pug. Dogs of Instagram have certainly had their moment in the spotlight, but right now, we’re totally obsessing over teacup Persians of Instagram. Those faces! That fur! Once you stare into the big round eyes of a teacup Persian, your life will change. 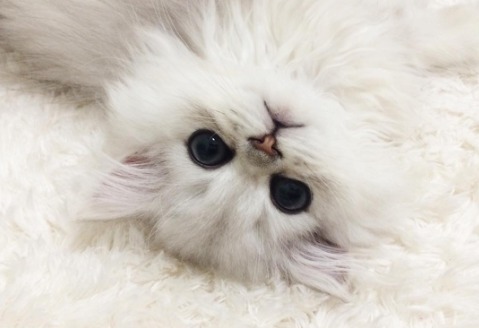 Here are 8 teacup Persians you should follow ASAP. Your Insta feed will never be the same again. Be. Still. Our. Hearts. Puff the tiny teacup Chinchilla Persian is an expert at batting his eyes at the camera (lusting after human food). His captions make us LOL every time. Gracie’s Instagram handle says it all: She’s a total doll face. This Silver Chinchilla Doll Face Persian posts adorable pics with hilarious captions to boot. We heart her! That name. That face. We’re completely in love with this Shaded Golden Doll Face Teacup Persian. Hanachan is a vocal cat with the sweetest little mew you’ll ever hear. Just one look into her gigantic eyes, and you’ll be in love! Emma’s account includes not one, not two, but THREE adorable Persians. Think you can handle it? Follow the daily cuteness of Emma and her brothers Oliver and Sebastian. Jaspurr (full name: Sir Jaspurr) may not like baths, but he sure is a cutie. B is as cute as a button. Not only does she share pics of her daily adventures like playing with her stuffed frog and getting a trim at the groomer, but she also shares an account with four other cats: Muffin, Kiki, Lulu, and Chloe. These two are double the trouble AND double the cute. Teddy, a red Persian, and Casper, a pewter Persian, are the best of friends.